I want to be a terrorist. In the terminology of going green. Since I was told I’m an heir to the Throne. What if I told you, I am xenophobic? I even want to be the unbearable stink under your armpits. Have you abide by purpose, not luck, purpose code of conducts. And have you ostracised for wanting change. Rebelling in the listeners’ subconscious mansion. But spirits and principles will collide. In the name of a plague. To prove whole, scientific fractions. I wish to sanction light bulbs to expose witchcraft. Not to any particular harmony. Waltz and cha-cha in praise. Tiny boats stay afloat and titanic ships sink! 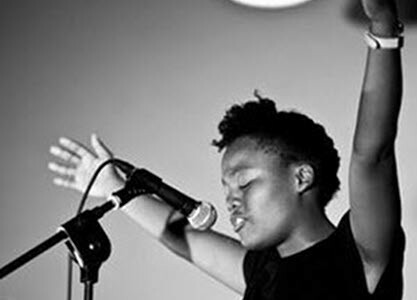 Performance poet, Koleka Putuma, is based in Cape Town and currently pursuing a degree in Theatre and Performance at the University of Cape Town. She facilitates and hosta writing and dialogue workshops at schools, community projects and interfaith programs in and around Cape Town. She has headlined at SliPnet’s Inzync Poetry Sessions, JamThat Session and at Off The Wall. She is a resident poet of the collective Lingua Franca. In 2012 she took second place in the Cape Town leg of the Drama for Life Lover + Another National Performance Poetry Slam Competition and represented the city at the national finals. Her work has travelled to Scotland and New York.